Valentine's Day is just around the corner, and many couples are putting the finishing touches on their gifts. While some opt for poetry or romantic getaways, others are all about bear skin rugs and JC Penney portraits, according to Estately. The site decided to figure out what presents Americans are considering for their special someone by running hundreds of possible gift-related searches through Google Trends, and recording which items were ranked the highest. The resulting map reflects search terms people in each state Googled more frequently than people in all other states. While not the most precise way to measure gifting per state, the search did yield some peculiar findings. 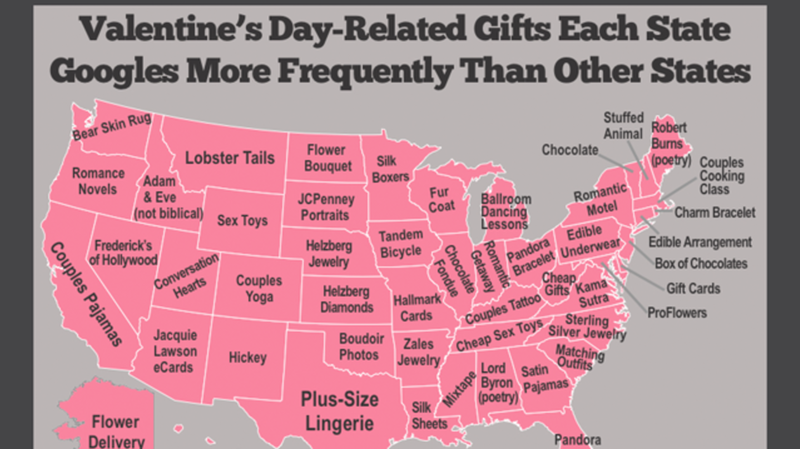 Most notably, Iowa's love of tandem bikes and New Mexico's fascination with hickeys. We are also curious to know how many cassette players are left in Mississippi.